"My life would have been more tranquil had I not seen the birds. Whatever it was they had found lay in the shadow of the oak, so I was nearly upon the thing before I recognized what they were feasting upon. The corpse wore black." Master Hugh is making his way towards Oxford when he discovers the young Benedictine - a fresh body, barefoot. The nearby abbey's novice master confirms the boy's identity: John, one of three novices. He had gone missing four days previously, and his corpse is fresh. There has been plague in the area, but this was not the cause of death: the lad has been stabbed. To Hugh's sinking heart, the abbot commissions him to investigate. 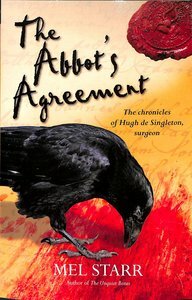 About "The Abbot's Agreement (#07 in Hugh De Singleton Surgeon Series)"
Order now to secure your copy when our stock arrives. eBook is Available. 0 Available. Expected to ship in 8 to 10 weeks from Australia.